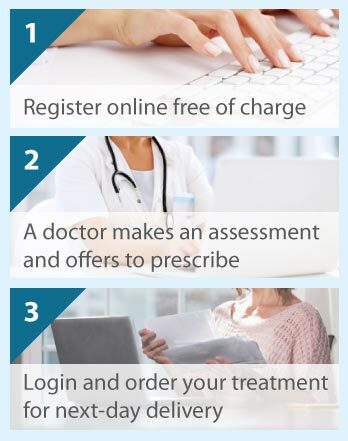 We can prescribe Lamisil (terbinafine) tablets online if you complete a consultation form and a prescription is deemed appropriate. The process is quick and easy. Next day delivery is included as standard. Click on the free consultation button to get started. Lamisil tablets contain a medicine that is used to treat skin and nail infections caused by a fungus called Tinea. The most common forms of these infections include Athlete's Foot (tinea pedis), Jock Itch (tinea cruris) which affects the groin, and ringworm infection affecting other areas of the body (tinea corporis). Lamisil is also used to treat tinea infections that develop beneath the finger or toe nails. The active ingredient in Lamisil is an antifungal medicine called terbinafine, which readily accumulates in the skin and nails. Terbinafine breaks down the cell membranes of the fungi. This causes the fungal cells to die and stops them from spreading. How to take Lamisil tablets? Lamisil tablets are taken once a day with plenty of water. How long you have to take the tablets depends on the site of the infection. Between 2 and 4 weeks treatment is usually sufficient for the treatment of tinea cruris. Four weeks treatment is required for Tinea corporis and anything between 2 and 6 weeks is needed to treat Athlete's foot. Nail infections may require treatment for as long as 3 or 6 months; this is because the fungus becomes trapped under the nail and complete nail re-growth may be required before you become symptom-free. If you complete a consultation form we can tell you if Lamisil tablets are appropriate for you. We will not be able to prescribe Lamisil if you are pregnant or breastfeeding, or if you think you may be allergic to terbinafine or any of the other ingredients in the tablets. Special advice will be needed if you have medical conditions affecting your liver or kidneys, or if you have psoriasis or systemic lupus erythematosis (SLE). Other types of medicines may interfere with Lamisil. We will be able to advise you about this once we have all your details. Most people get no side effects at all. However, the side effects of Lamisil can include headache, stomach upset, muscle or joint pains or the appearance of an itchy rash. These symptoms are usually mild and go away after a few days. A few people (about 1 in 100) experience taste loss or disturbance which nearly always returns to normal after completing the course of treatment. In the very unlikely event that you develop a severe rash, or notice that your urine is dark and your stools are pale you must see your doctor at once. Also make an urgent appointment if you experience breathing problems, severe stomach pain, muscle weakness or become unusually tired and listless.